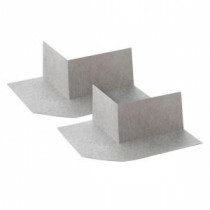 Buy online Shower System Preformed Outside Corner (2-Pack) 170125 and leave review or share with Your friends. The USG DUROCK Shower System preformed inside corners utilize state of the art materials to create waterproofing inside corners for use in fully bonded waterproof shower construction. Helps you create a truly integrated and fully waterproof system. Designed to prevent moisture in its tracks and to act as a solid base for a shower that will last for years to come.